County Fair is one of the largest poultry producers in Southern Africa. County Fair are processors of over 4.2 million chickens per week. Growing these chickens is a large operation and ensuring the chickens have the right environment is of utmost importance. County Fair wanted an easy way to monitor its chicken shed to verify that the environmental conditions for the chickens was at its best. This would ensure healthy chickens could be produced. 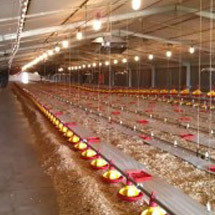 County Fair chose Applied Information to supply a chicken shed monitoring system. The chicken monitoring system supplied by Applied Information was designed to monitor the environmental conditions of the chickens. If the environmental conditions went out of the normal operating conditions, an alert would be sent to the necessary personnel to rectify the problem. The first pilot scheme for low cost, web-based monitoring and alerting of environmental conditions in chicken sheds has been installed and commissioned. The simplicity of the system has impressed the customer, as the panels, GPS, sensors, cables and even the mounting screws and cable ties were all provided with the system. Just string the sensors with cable ties, and plug into a wall outlet, and the system immediately came on line. Glance , the cloud based monitoring software, provides the trending of temperature, humidity, outdoor temperature, and power monitoring, with text and email alerting, to easily and effectively manage the chicken growing process.